Now you have learned the ways to catch crabs, it's time to spend, spend, spend! Unless you want to risk going into the perpetually cold water and catch crabs bare hand, and do it illegally, you will need to buy something. The stuff aren't cheap, but if you go often enough and catch enough crabs, the equipment is going to pay for itself, and then some. Consider this: Dungeness crabs typically sell for at least for $5 a pound (most places don't sell red rock crabs). A legal-sized crab is at least 2 pounds. If you catch 4 crabs a day (4 is the legal daily limit), you earn $40 worth of crabs. This will exceed the cost of transportation and bait. If you go enough times and catch enough crabs, you are going to, in theory, make money (although it is illegal for you to sell or barter crabs caught by sport fishing). You also get delicious seafood on the dinner table. You need to get a certain number of equipment to catch crabs. There are many choices for you to make regarding your equipment. What you will need depends on what method you are going to use to catch crabs. These methods will be explained in the crabbing method page. There is one thing you will need regardless of how you catch crabs, and that is a fishing license. You will need a license to catch crabs, or do any other types of fishing. Crabbing qualifies as sport fishing. The kind of license you need to purchase is a tidal water fishing license. Be sure you don't mistakenly buy the fresh water one. You can't use that to legally catch the two species of crab that you want. The two licenses are in different colours. Below is a table displaying the current prices for a tidal water fishing license. Licensing Explanation: Annual licenses last from the date purchased to the following March 31. Licenses that are for shorter periods expire on midnight on its final day. The license is not transferable and is not valid unless the person signs it. You have to buy the license in person unless that you are getting one for your child(ren) under 16 years of age or for your spouse. Resident means a person who normally lives in Canada. You need to remember to bring your license when you go crabbing because a fisheries officer can come out of nowhere and ask to see it. Fisheries officers are very, very sneaky. You will get a hefty fine if you are caught fishing/crabbing without a license. Go to the General Regulations page for more comprehensive information about fines and other punishments. You can go to Department of Fisheries and Oceans(DFO) Pacific's licensing page for better information about licenses. You can purchase a fishing license from some fishing equipment stores or department stores such as Wal-Mart. The complete vendor list is available at the DFO website. Also if you rather buy the license online, you can now do so at DFO's online licensing system. They accept most major credit cards. This is one of the few things you need that you don't need to pay money for. You should have a general understanding of the rules and regulations that apply to you if you go crabbing. This doesn't mean that you will have to remember every single little detail, but you need to understand the important ones. Doing so will keep your crabbing experience from turning unpleasant (if you got fined). To see the regulations, you can obtain a brochure from a fishing inspector, an information centre near a prime crabbing spot, or you can go to the DFO's regulations page for the complete list. The rules applying to crabbing will be listed in the General regulations section of this website. A handy tool you will need is a caliper. For those who don't know what a caliper is, a caliper is a F-shaped tool used for measuring horizontal distances. It doesn't take a genius to figure out how to use this thing. You probably can do it in seconds. A caliper is made of a L-shaped big piece and a smaller piece that can slide up and down the bigger piece. To measure a crab's carapace, you set your caliper to maximum width, put the carapace's widest spot between the now C shape caliper. Then you slide the movable piece toward the shell until you can't slide it any more. Finally, look at your caliper and look what number the sliding piece is against. That is the crab's width. You may find that using a caliper is even simpler than what I said. Calipers are better than rulers at measuring the carapace width of crabs because they only measure the horizontal distance, which is what you want. Rulers are affected by the curve on the crab's shell and may not measure correctly. Calipers are widely available and you can find one at most hardware stores. Just buy one that works. There is no need for those fancy ones with digital displays, unless you like to show off a lot. Some stores also sell caliper type device specially made for measuring crabs. The legal sizes of all the edible species of crabs are marked on the devices so you won't have to bother to remember the legal size limits. This is the most popular method for catching crabs. You will need at least one of all the items below to use this method. 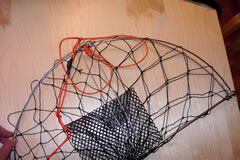 Ring nets are perhaps the simplest and cheapest of all crab traps. It is basically a basket made of two solid rings connected by cotton or nylon mesh. The top ring has a larger diameter than the bottom ring. When deployed, the ring net becomes flat on the sea floor, giving crabs access to the bait in the centre. When the operator pulls the trap up, the top ring rises first, pulling up the mesh. This creates a temporary wall that traps crabs and other creatures that were inside until you pull it up and put it on the floor. As stated in the previous paragraph, ring nets are one of the cheapest type of traps. You can probably find one under $20. Look up the SuperPages (the yellow phonebook) to find a fishing equipment store near you. Some major department stores also sell ring nets too. Ring nets come with several disadvantages. One thing is that there is nothing preventing crabs from exiting the trap after it has entered the trap while the trap is resting at the bottom. This means that crabs can free load off your bait and you can't really do anything about it. Because of this disadvantage, ring nets needs to be pulled up at least once every 15 minutes and when you pull, and you have to pull quickly or your precious catches may escape. Another disadvantage is that since there is no top piece on these traps, you are forced to secure the bait on the bottom of the trap. If the trap lands on an uneven surface, crabs and other creatures can pick at the bait from under your trap, or large creatures like a seal can show up and rip off your bait. Another kind of trap you might encounter is the pyramid or star trap (pictured left). These traps are made of metal wires. It is called a star trap because when it lays flat, it looks like a star. This thing is also called the pyramid trap because when being pulled up, it makes a pyramid shape, trapping crabs inside. The bait is placed in the bottom of the trap. Pyramid traps are about the same price range as ring nets, but are more common (I saw more pyramid traps than ring nets during my crabbing experiences). They also have all of the disadvantages of the ring net plus that this thing is harder to deploy correctly. Because of this trap's four moving parts, the trap can easily land wrong (like one triangle gets under the square) and has to be pulled up and deployed again. For some unknown reason, more people use star traps than ring nets. The top picture is what the crab net looks like when deployed, and the bottom picture is what it looks like when the rope is being pulled. 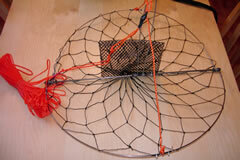 Another type of small crabbing contraption I've come across is a circular net/trap thingy. I'm not sure what its proper name is so I'll just refer to it as the crab net. Some people also call it the snap trap. Anyways, this contraption works sort of similar to star/pyramid traps since when deployed, the net lies flat on the ground, allowing crabs to access the bait. When pulled, the net folds in half into a semi-circle, and whatever happened to be on the net at the time will be trapped inside. 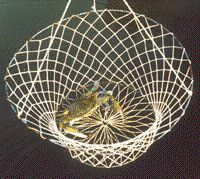 As this kind of "open" trap, the crab net suffers the same disadvantages as the ring net as the crabs can eat and leave while the net is resting on the bottom. The bait bag also may have to reinforced to guard against large creatures such as seals that may come along to pick at the food inside. Another potential inconvenience is that the strings used to close the trap will also sometimes tangle up. 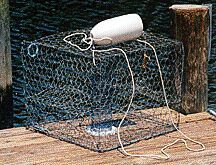 However, the crab net does have a signifcant advantage over the ring net and star/pyramid traps in that the trap can be cast very far from the dock/pier. In skilled hands, the net can probably be thrown nearly 20 metres (60 feet). The longer throwing distance means that the trap has access to more crabbing territory and can reach further and deeper waters than other types of traps when deployed from land. This type of trap is also pretty cheap and can be found for as little as $10 Cdn. The crab pots/cages are the best and most complex traps there are. They come in many shapes and sizes. Some have advanced features that includes no-exit entries, a tray to hold bait and a top that opens for easy extraction of crabs that are inside. These traps are also more expensive than other types. A good pot will set you back at least $40, but it will not have the disadvantages of ring nets or star traps. There are so many choices to make when it comes to buying one of these traps. I recommend that you buy the biggest one you can afford. Good features to have include no exit entries and the trap should be collapsible, so it can be easily stored. It is all up to you what sort of traps you get. Other than the traps discussed above, there are more variations out there. Some people prefer to make their own traps, which is perfectly fine. No matter if you are going to buy or make your traps, be sure it complies with the regulations made by the DFO. You can see these in the General Regulations section of this website or go to the DFO's web page regarding trap regulations. This is something you don't have to worry too much about. You can use basically anything that's meat, because crabs are not picky eaters. Most recreational crabbers use chicken neck or spine, since they are cheap and considered scrap. Crabs seem to love them too. Other often seen bait include fish bones and chicken drumsticks. Based on my relative's experience, a combination of chicken bones and salmon parts work quite well, although the salmon has a penchant for attracting seals. Other good bait that I've heard about are raw duck neck and a kind of small fish from the local waters. In case of the drumsticks you may be better off eating them yourself, but they might also work better than just chicken bones. Some sources also recommend that you leave the bait outside and supposedly the stink that develops makes the bait more attractive to the crabs. You should have some wire handy to secure the bait to the trap unless you have a pot with a tray. This is to prevent crabs or other animals from dragging the bait out of the trap. You should be worried about this if use traps that lie flat on the sea floor. Sometime big animals like a seal will come and bother your traps and a piece of bait that is not secured in an open trap is a free meal. To avoid the incovenience of using wires, you can also choose the purchase a bait bag (see picture) to store you bait. A bait bag is basically a small net/pouch to store your bait in. The addition benefit of a bait bag is that the crabs have a more limited access to the bait due to the net, so that the bait might last longer, and that could be important if you are using a pot and leaving it in the water for a long time. Of course, this limited access also might mean that crabs will be less interested in the bait. Any strong rope will do for securing traps. Each piece of rope should at least be 10 meters long. The ropes don't have to be too thick. One with a diameter of 1cm will do. You will need to put the crabs you have caught somewhere while you are trying to catch more or transporting them. Any large container (around 10L) that can hold water can be used A container with a lid is a plus especially if you plan to transport the crabs in the trunk of your car. Imagine if you suddenly make a sharp turn, what would happen inside the trunk of your beloved car if your water filled container had no lid? You don't want to know. As a simpler and perhaps better way, you can just wrap each crab with some old newspaper/paper towel for transport. For some reason, crabs might actually live longer when they are transported and stored this way, and it's much easier than carrying a bucket full of water around. You will need all of the equipment needed in the previous method plus a water transport (boat) and buoys to deploy traps from over the water. The boat you get should at least big enough to sit you and all of your equipment (that is unless you want to push the boat or drag your equipment behind you). The buoys should have bright colours. This makes it easier for you and other boater to see the buoys and react. Go to your local boat dealer for your boat and buoys are available at fishing equipment stores. If you don't know where they're, look up the SuperPages or whatever it is called these days. If you truly can't find one or you are one of those frugal types, an empty 4L milk jug will do fine. 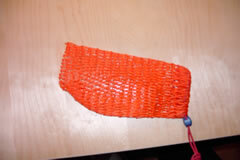 Dip nets are cheap and widely available. Buy the ones that are sold in fishing equipment stores because they're usually bigger. As for the fishing rod and reel, those things can be found almost anywhere. This might sound repetitive, but you should look up the SuperPages for scuba equipment rentals and retailers if you plan to use scuba equipment to dive. You might be thinking that why do I keep telling you to use the yellow phone book. That is because the phone book is one of the best place to find stores. The absolutely safest way to pick up crabs. If you go for the bare hand approach for picking up crabs, you will need to have some of these. Crabs are temperamental and unpredictable. They also can cut your fingers.